The Eads Bridge will close to traffic at 8 p.m. this Friday, Oct. 21, for construction and will reopen at 3 a.m. Monday. To keep MetroLink passengers moving, Metro will operate a bus shuttle. MetroLink passengers will be transported by bus between the Arch-Laclede’s Landing MetroLink Station and the 5th & Missouri MetroLink Station from the beginning of service on Saturday, October 22, until the end of service on Sunday night, October 23. The East Riverfront MetroLink Station will also be closed to customers. MetroBus shuttles will operate between the East Riverfront MetroLink Station and the 5th & Missouri MetroLink Station. The station will reopen Monday morning, October 24, at start of service. MetroLink riders traveling between Missouri and Illinois should allow an extra 20 to 30 minutes for their trips this weekend. The Blue Line will not operate in Illinois Saturday or Sunday. 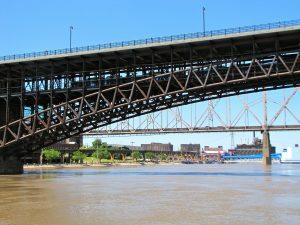 For more specific details on the bus shuttle service for Red and Blue MetroLink lines, see Metro’s Rider Alert on the Eads Bridge closing.